Watertown police chief Edward Deveau joins MSNBC's Craig Melvin to recount the details of events leading to one of the Boston bombing suspect's capture. "I am extremely lucky I'm not at a funeral this morning for one of my officers," he said. A lone small-town police officer confronted the two Boston Marathon suspects on a dark street after they got out of their cars and started shooting at him, the Watertown, Mass., police chief said Saturday. In the ensuing firefight, the suspects hurled a pressure-cooker bomb similar to the two that went off near the marathon finish line, said Chief Edward Deveau. They also tossed four homemade grenade-like devices, Deveau said, with two of them exploding. The two men were in separate cars when they were confronted, he said — apparently one of their own and another that they had carjacked. Deveau said police tracked one of the cars because the carjack victim’s phone was still inside. The lone officer, whom he identified as Joe Reynolds, was told not to engage the suspects, but the suspects fired on him from separate locations, Deveau said. Under fire, the officer put his cruiser in reverse to back away while other officers arrived, he said. Six Watertown police officers were involved in the fight, plus a transit officer who was shot in the groin and bled heavily, he said. The pressure-cooker bomb exploded, and the lid was found embedded in a nearby car, Deveau said. There were three explosions in the firefight, in addition to 200 rounds of gunfire, he said. An ATF agent leans over Boston Marathon bombing suspect Dzhokhar Tsarnaev after he was taken into custody in Watertown, Mass., on April 19, 2013. One of the suspects, Tamerlan Tsarnaev, was killed in the firefight. The surviving suspect, Dzhokhar Tsarnaev, later hid in a boat behind a Watertown house and was cornered and captured alive by authorities. On Saturday, Dzhokhar Tsarnaev was under heavy guard and in serious condition at a Boston hospital — the same hospital where some victims of the marathon blasts are still recovering. Federal law enforcement officials told NBC News that prosecutors did not expect to finish work on charges against Tsarnaev on Saturday. The charges were more likely to come Sunday, they said. The FBI confirmed that in 2011, it probed Tamerlan Tsarnaev for possible extremist ties after a tip from a foreign country that he was a "follower of radical Islam" and planned to join an underground group. Agents grilled him and neighbors and did not find "any terrorism activity, domestic or foreign." The brothers allegedly executed a Massachusetts Institute of Technology patrol officer before they drove to Watertown and the firefight began. Boston Marathon bombing suspect Dzhokhar Tsarnaev was captured alive but wounded Friday night, after holing up in a boat in a Watertown, Mass. backyard following a bloody rampage. He remains hospitalized and has reportedly lost a lot of blood. NBC's Ron Allen reports. Dzhokhar Tsarnaev was being held at Beth Israel Deaconess Medical Center, where 11 victims were also being treated after two blasts tore through crowds at the finish line of Monday's race. He was wounded in the firefight with cops but escaped, sparking a daylong lockdown of Boston and surrounding towns. 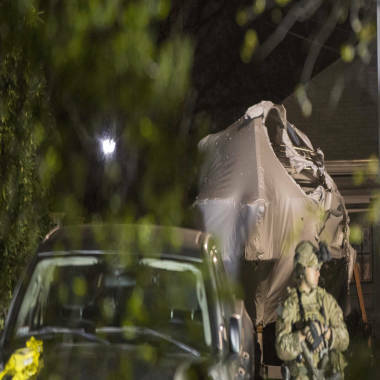 A door-to-door manhunt had just ended when a Watertown man noticed blood on the tarp covering a boat in his backyard, peeked under and found the suspect, a relative told TODAY. After a standoff punctuated by bursts of gunfire, police grabbed the accused bomber, unleashing a celebration that had people cheering "USA! USA!" and dancing in the streets outside Fenway Park. "CAPTURED!!! The hunt is over. The search is done. The terror is over. And justice has won," the Boston Police Department tweeted minutes later. Authorities said they were still trying to determine whether the suspects had help. Even as the standoff took place in Watertown, the FBI was taking three people in for questioning in New Bedford, Mass., who were believed to be former roommates of Tsarnaev. "No one was detained. No one was arrested," a spokesman with the Massachusetts FBI office later said, once the two men and one woman questioned in connection with Tsarnaev were released. Tsarnaev will be questioned by a federal team called the High Value Detainee Interrogation Group, which includes officials of the FBI, CIA, and Defense Department, an Obama administration official said. Under a special legal exception designed to protect public safety, he will not get a Miranda warning or be offered a lawyer for up to 48 hours. Meanwhile, finally freed of the weeklong grip of terror, Boston rejoiced. The Red Sox on Saturday played their first home game since the marathon attack. During a pregame ceremony, an American flag was unfurled to cover the historic 37-foot left field wall at Fenway Park, the Green Monster. Patrick joined Boston police on the infield during the national anthem, and fans roared the last few bars. Some held up their own flags in the stands. In the seats atop the wall, fans held up placards that spelled out, “THANK U BRAVE HEROS.” Red Sox players wore special patches on their jerseys. The arrest came four days after three people were killed and 176 wounded at the marathon. The big break in the case came Thursday evening when the FBI released surveillance photos of the brothers from the race and said they were trying to identify them. The suspects' desperate attempt to flee set off a bloody chain of events. Tips were pouring into an FBI hotline when they fatally shot MIT officer Sean Collier, 26, in his vehicle at 10:20 p.m., law enforcement officials said. Police called it an "assassination." The brothers then stole a Mercedes SUV, holding the driver captive for a half-hour while they tried to use his cash card to get money from three ATM's, a source said. At the first, they put in the wrong number; at the second, they took out $800 and at the third, they were told they had exceeded the withdrawal limit, the source said. An FBI officer stands in front of the boat at 67 Franklin St. where Dzhokhar Tsarnaev, the surviving suspect in the Boston Marathon bombings, was hiding in Watertown, Mass., on April 19. The carjacking victim was released unharmed at a gas station in Cambridge and the accused bombers sped in his car toward Watertown. A police chase ensued and they tossed explosive devices out the window, officials said. A transit officer, identified as Richard H. Donahue, 33, was seriously injured during the pursuit. Authorities said he underwent surgery at Mount Auburn Hospital. Witnesses said Tamerlan Tsarnaev, who had an improvised explosive device strapped to his chest, ended up on the ground and Dzhokhar barreled the SUV down the street to get away. Armored vehicles and SWAT teams streamed into Watertown and residents were told to stay indoors. Boston subways and buses were shut down, Amtrak service to Boston was cut, and college campuses were closed. The Red Sox and Boston Bruins' home games were canceled. 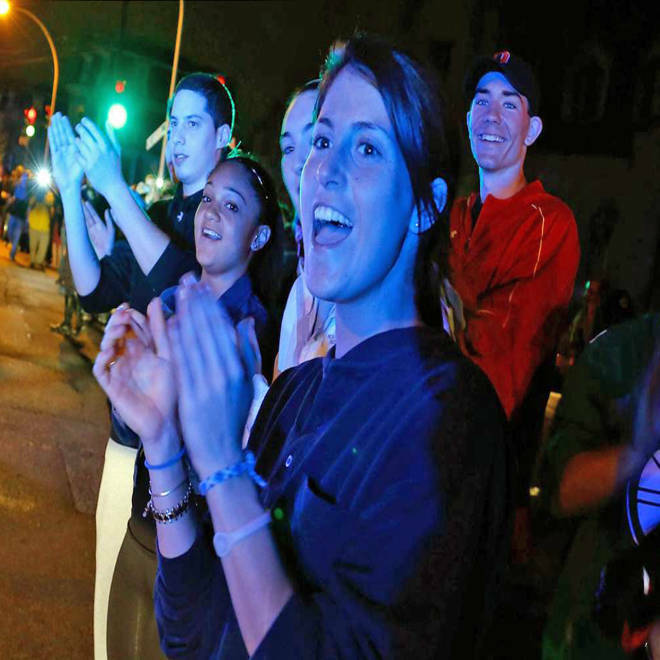 Police finally gave residents the OK to venture outside about 6 p.m., only to order them back an hour later when Dzhokhar Tsarnaev was found.